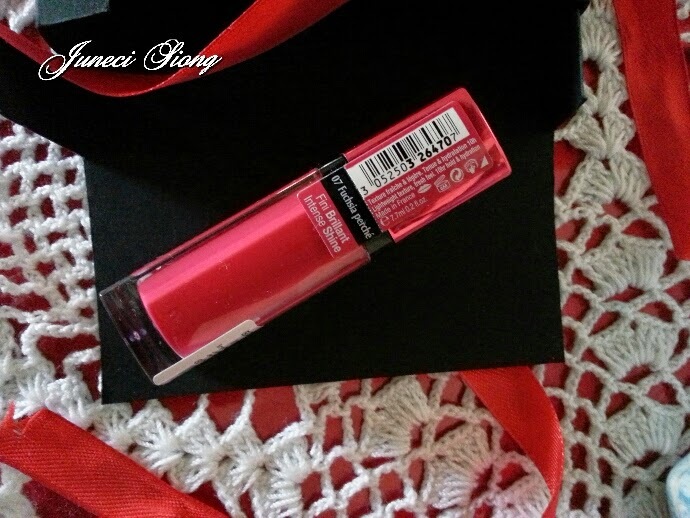 BOURJOIS has recently release a new line of cosmetic into our beauty market and today, I am going to review this latest sensation. "I'm Dazzlingly shiny but not Sticky..."
"I'm long-lasting but don't dry out the lips..."
"I'm surprisingly delicate and yet offer a great coverage..."
"I'm light and refreshing but also intense and glowing..."
"Exceeding refreshing and sensuous, I'm sought after by everyone!" This new Hybrid Lipstick has higher water concentration and infused with Nymphea extract which promises lasting moisture up to 10hours. Because this beauty babe is so smooth and fine, you won't feel that you are wearing lipstick as it also comes in non-sticky formula. 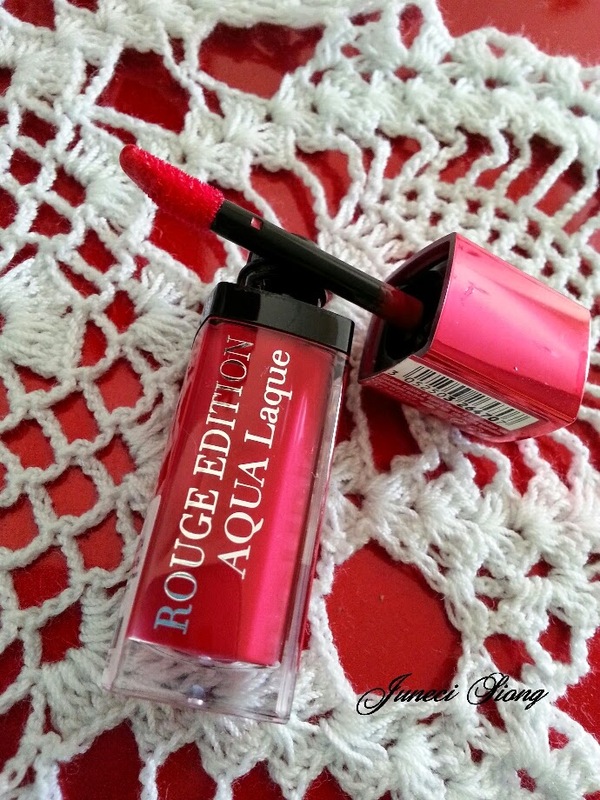 BOURJOIS Aqua Laque contains the utmost pure and glowing colours. The absence of butter and wax has ensured finest quality of colour. This gives us the most explosive colours as each one fully expressed its colour spectrum. This babe has a new name; the wet look shine. 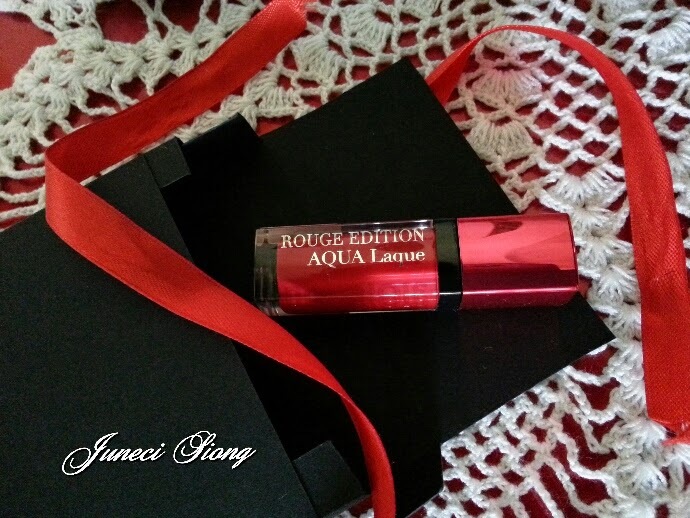 Redefining shine, Aqua Laque has it all; sophisticated and modern, elegant and sensual, intense and natural. 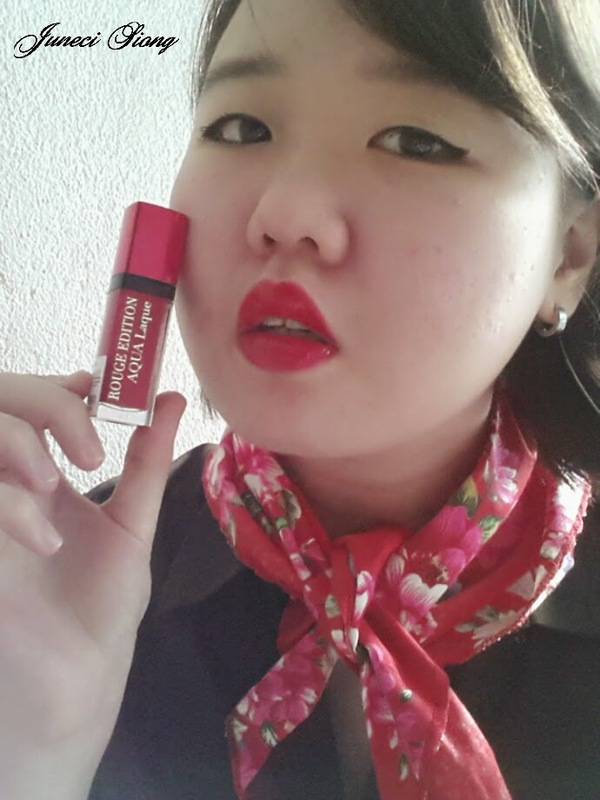 With its emulsion-like properties, inspired from technology used in foundations, BOURJOIS has reduce the presence of oil so that the lipstick would not budge or transfer onto small cracks when applied. Aqua Laque comes in an elegantly faceted high-shine fully chrome cap, revealing pure and shimmering colours on the inside. Doesn’t matter if your style is chic, beautiful, feminine or Parisian, there is a colour for everyone. 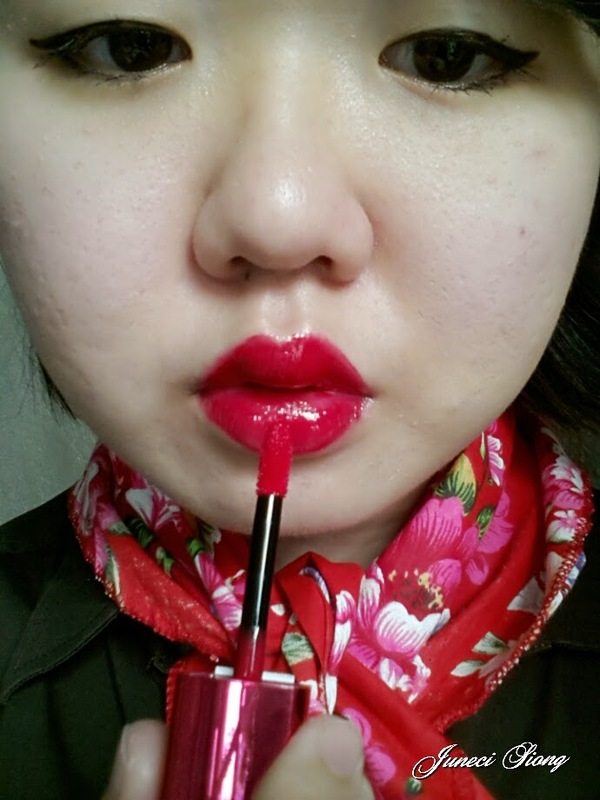 It’s soft, dense flock applicator allows accurate application for the perfect lips. The texture was indescribable; It’s almost like emulsion thickness but yet feels light on skin. I expected Aqua Laque to feel think on lips but I was surprised. It is absolute weightless with a little bit of water-sensation. Altogether pleasantly fresh! I don’t know if it’s because of Fuchsia color in nature, but Fuchsia Perche requires two layers of application for the perfect coverage. One thing I like about it was no lip liner is required at all! 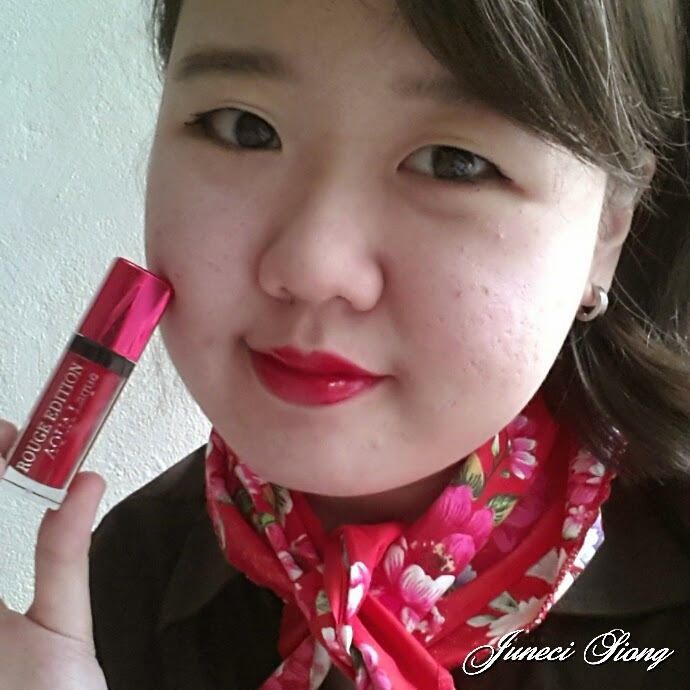 The applicator is designed in a way for fine lips lining with the help of this hybrid lipstick’s texture. You can see from my pictures how defined my lips are. Holding true to it’s words, Aqua Laque is able to retain moisture. I like how it leaves a sheer tinting after wearing out. Credits: Thanks to Mummy for driving me to their HQ to collect the product. Disclaimer: This is a sponsored post. The products are evaluated based on my honest opinion and not biased.